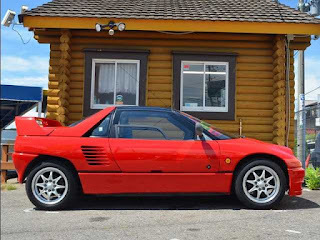 Autozam AZ-1 legal for import to the USA starting September 2017. The Autozam AZ-1, known as the framecode PG6SA, is a mid-engined sports kei car, designed and manufactured by Suzuki but sold by Mazda under its Autozam brand. It was produced from October 1992 to 1994, and was perhaps most noted for its gullwing doors. Power came from the same Suzuki-sourced 657 cc turbocharged engine used by the Mazda Carol that produced 64 PS (47 kW) at 6500 rpm and 85 N·m (63 lb·ft) at 4000 rpm. Suzuki produced its own badge engineered version named the Suzuki Cara (PG6SS).